This paper was prepared as a conceptual framework to stimulate discussions on the role and applicability of tradable permits in water pollution control among participants of the Technical Seminar on the Feasibility of the Application of Tradable Water Permits for Water Management in Chile (13-14 November 2003 in Santiago de Chile). In Chile, water pollution is a major problem. Until recently, existing regulations to control water pollution consisted mainly of non-market based instruments. Innovative instruments are now being explored via a recent national law for tradable emission/discharge permits. The instrument of tradable discharge permits is one of several market-based instruments used in water management and pollution control. Tradable discharge permits are actually among the most challenging market-based instruments in terms of both their design and implementation. Experience to date with tradable discharge permits for water pollution control has been limited and mainly comes from several regions of the US and Australia. The paper at first introduces tradable permits as part of an overall taxonomy of economic instruments in the field of water management. In this context, three fundamentally different fields of application of tradable permits systems relating to water are presented: tradable water abstraction rights, tradable rights to water-based resources and tradable water pollution rights. The remaining of the paper deals exclusively with the latter category, i.e. 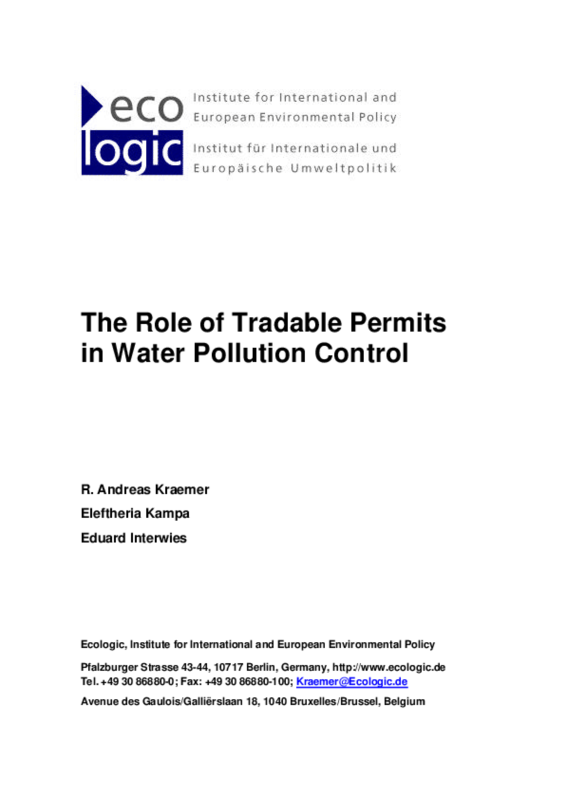 tradable water pollution rights, their role and applicability in water pollution control. Copyright 2003 Ecologic, Institute for International and European Environmental Policy.